Last night I met with Gjon Feinstein, Mike Splane and Dan Burkhard to go over some recent games. Mike and Dan had just finished playing in the seven-round Kolty Chess Club championship. Dan tied for fourth, with three wins and four draws, and he was very eager to show us a game from round five. It was a quintessential Dan Burkhard game, a completely strategic victory with no tactics. 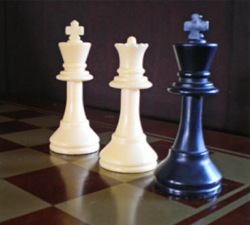 When you listen to Dan talk about chess, it seems as if he considers tactics at best a necessary evil; he would much prefer the game to be all strategic maneuvering. In this particular game, he he had his way. There was a position in the opening, or early middlegame, that I thought was kind of interesting. Dan’s opponent has just played 12. Bh3, and Dan surprised all of us by playing 12. … f5!? Part of the surprise is that it seems inconsistent with his professed style of play. The highest praise you can give a move, in Dan’s world, is that it’s “flexible.” The worst thing that a move can be is “committal.” His idea of how to win a chess game is to sit there making flexible moves until the opponent makes a committal move, and then punish it. But isn’t 12. … f5 just about as committal as they come? It fixes the pawn formation on the kingside and commits Black to accepting an ugly weak square on e6 and a potentially weak pawn on e7. The reason for this decision, Dan said, was that he wanted his opponent to try to attack e7. Dan has so many pieces that can defend e6 and e7 that he isn’t the least bit worried. In fact, Dan insisted that the pawn on e7 and the hole on e6 are not weaknesses. As we analyzed the position, it became clear that his way of looking at it was totally different from ours. Gjon said that maybe 12. … f5 wasn’t so bad, because after 13. Re1 Black can play 13. … e5 right away. After 14. de Nc5 White is not going to be able to maintain the pawn on e6. As you can see, Gjon’s instinct, which I agree with, was to eliminate the weakness as quickly as possible. But Dan, who was in denial that a weakness even existed, did not even consider … e5. His whole plan was to play … Re8, defend the pawn, and then start advancing his pawns on the queenside. Dan’s plan absolutely worked to perfection. His opponent put his rook on e2, his queen on e1, and then just scratched his head because the queen and rook were going nowhere. He also never found a useful square for either of his bishops or the knight. Meanwhile, Dan slowly increased his pressure on the queenside with … a6, … b5, a pawn trade on b5, … b4, and tripling his heavy pieces on the a-file. Eventually he broke through and won a pawn, and that was that. So do I now think that 12. … f5 was a good move? No. I would say that it’s not as bad as it looks. One reason it works is that White’s pieces are so badly organized. The piece that White really wants to maneuver to e6, the knight, absolutely can’t get there. But I think there are lots of things White could have done better than in the game. First, after 13. Re1 Re8 (if Black insists on this passive move) I would complete my development with 14. Be3, with ideas of playing c5 and threatening a discovered check. If Black plays 14. … c5 to stop the discovered check idea, now I think I would try to improve the position of my other bishop with Bf1, Bd3, Bf2, and h4. I’m going to push to h5 and try to loosen up his kingside pawns, and I am thinking about a possible sac on f5. There are probably lots of other equally good plans for White. However, it’s important to realize that White can’t win with a frontal assault on the e-file. He needs to finish his development, first of all, and then try to open up some other fronts, especially on the kingside. It’s only after Black is distracted with other threats that the penetration of a white piece to e6 will become dangerous. Mike and I both thought that instead of 12. … f5, Black should play 12. … Nf5 instead. This creates an option of playing 13. … Nd4 and THEN … f5, if Black wants to. If White stops this with 13. Bxf5, then he has given away his advantage of the two bishops and Black has a stronger pawn mass in the center, which he can start advancing with … e6 or … e5. Dan’s reaction to this suggestion was kind of strange. He said he couldn’t handle both changing the position of his pieces and changing his pawn structure. I guess it was too committal! It seemed as if he would really rather have his knight on h6 than on d4. Well, I don’t mean to be too critical of Dan. He won the game, after all! It’s just interesting when you met someone whose concept of chess is dramatically different. The best thing you can do is learn from their strong points without falling into their hangups. The things I liked about Dan’s play were his idea of baiting the opponent into attacking a pseudo-weakness and simply the fact that he had a plan and stuck to it. That was really why he won — not because he played 12. … f5 or because he played so-called “flexible moves,” but because he had a plan and his opponent didn’t. We talked for a long time about this position. I thought Dan had an interesting idea with f5. It totally kills all of the play on the kingside, where White had the advantage, His extra pawn and bishop pair could have become really dangerous if Dan allowed one or two pairs of pawns to be exchanged. I don’t see any active plan for White after …f5, unless he immediately trades pawns on c6 to get some freedom of action for his bishop pair. I was not as concerned about the e7 and e6 squares as Gjon and Dana. I didn’t see them as particulary weak since there is no obvious way for White to exploit them. 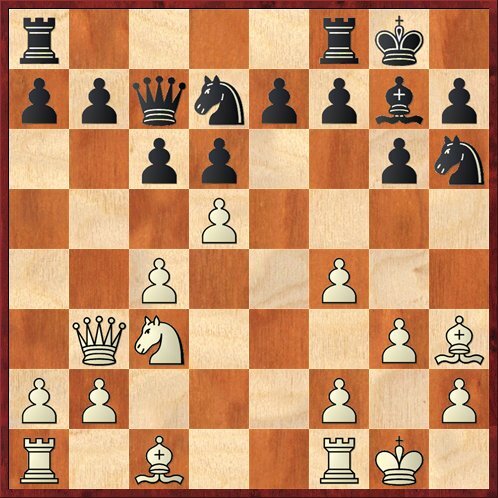 Sure White can put pressure on the file and tie down a couple of Black pieces for defense, but Black has lots of pieces that don’t have any aggressive function anyway. As Fischer said, to get squares you gotta give squares. Personally I thought it was a reasonable exchange. I did agree with Gjon and Dana that pushing the e-pawn was potentially useful for Black, but my reasoning was that he has no active squares for his knights so maybe he could free up some central squares to use as knight outposts. I considered the lack of squares for the knights to be the main drawback of Dan’s idea. Dan was eventually able to play b5 but I didn’t see how he was going to generate play if his opponent had stopped that idea, although maybe he could play b5 as a benko-like gambit.